Both Colombo All Share Price Index (ASPI) and Milanka Price Index (MPI) fell 0.72% and 0.26% during the week, despite the market closing on a green note. The indices were mostly on the up throughout the day helped by blue chips according to brokers. Retail interest continued to feature prominently during the week. The All Share Price Index (ASPI) closed at 7,406.02 points, rose 0.41% by 30.12 points and the Milanka Price Index (MPI) topped 0.11% by 7.43 points to close at 6,857.40 points. Turnover was at Rs.4.14 billion (fell 17.63%) with a volume of 182.9 million shares changing hands (up 11.16%). Foreign purchases dropped 5.26% to Rs.322.26 million and foreign sales rose 0.89% to Rs.239.9 million. Price to forward Earnings Ratio (PER) rose 0.4% to Rs.24.9 times. Land and Property sector was the main contributor to the market turnover due to Colombo Land (CLND), while the sector index rose by 3.54%. Colombo Land (CLND) price peaked at Rs.54.90 and closed at Rs.50 as profit taking continued. In mid May 2011, a 20 percent stake in Colombo Land (CLND) was sold by a founder Singapore based shareholder to Imagewise, a controlling shareholder of listed Citrus Leisure (REEF), and Kalpitiya Resorts, a subsidiary. 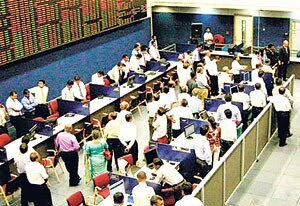 Colombo Land said in a stock exchange filing that on Thursday Imagewise sold 14.5 million shares of its shares at 43.50 rupees and Kalpitiya Beach Resort bought 20.35 million shares at an average price of 43.59 rupees. The company's board has resigned with N H Godahewa replacing R R Tudawe as chairman and appointing Imagewise Director Dilith Jayaweera to board. Banking, Finance and Insurance sector also contributed significantly to the market turnover helped by Nation Lanka (CSF) and Commercial Credit (COCR). The index rose 0.62%. Nation Lanka (CSF) price increased 3.73% and closed at Rs.30.50 while Commercial Credit (COCR) price increased 21.28% and closed at Rs.38.90. 1million shares of Royal Ceramics (RCL) changes hands today at Rs.165. Prices of most Vaillibel One (IPO of which is scheduled shortly) related counters saw price increases during the day. Another crossing of 103,700 shares of Commercial Bank (COMB) was witnessed at Rs.270.